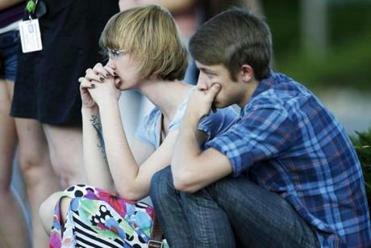 After hearing about the horrors of last night’s massacre at the movie theater in Aurora, Colo., kids may be expressing some understandable fears and anxieties about such an event happening in their own hometown. Cable news has been flashing images from the movie theater all day -- including cellphone video taken by moviegoers fleeing the scene -- and some of the victims were school-age children. Here’s some advice from mental health specialists on how parents should talk to their children and allay their concerns. 1. Validate their feelings. “Let them understand that they are entitled to feel how they’re feeling,” said Elizabeth Stults, a licensed mental health counselor who has a pediatric practice in the Back Bay area. They might be scared, angry, or anxious, or they might not be affected much at all since it happened far from where they live. 2. Explain that events like these are very rare. Although parents can’t tell kids that a movie theater shooting will never happen in Boston, they can stress the point that such occurrences are very rare, which is why they’re big news when they do happen. Police arrested 24-year-old James Holmes in connection with one of the deadliest mass shootings in recent US history. 4. Give kids a little leeway to deal with their anxieties. “If a child doesn’t want to go to a movie for a few weeks, don’t force him,” said Stults. “But also explain that we can’t stop living our life and not enjoy it.” When parents do take a reluctant child back to the theater, stick with a comedy or light-hearted film, not a violent one. 5. Develop a safety plan if such an event ever did occur. This can help kids gain a sense of control. “Talk to them about what they could do if someone started shooting,” said Ruskin. “Maybe run at super-speed or hide under the chair.” Kids will feel more secure if they have a plan in mind for dealing with the unthinkable.